Peperomia marmoratais a compact houseplant with rounded fleshy, silver leaves that are deeply ribbed. Highly suitable for container growing. 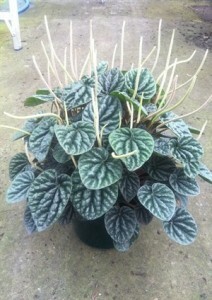 Peperomia marmorata is an easy to care plant that add beauty and style to courtyards, patios and verandahs. Provides green life to the indoors and help to freshen the air of your home. For best results, regularly feed with a liquid fertilizer during the growing season.